It’s time to create your ideal bathroom. Your shower needs to reflect your style, your showering needs, as well as the overall look of the bathroom. So what do you need to consider before choosing tile for your shower? How Slippery is the Tile? Tile comes in many different sizes and textures, so it’s best to be aware of what sorts of tiles could be a safety hazard if they were installed on the floor of your shower. Glass is usually too slippery to put on the floor. If you really want glass, no problem! This would be a great choice for the walls. When you are choosing tile for the floor, be sure to pick tiles that are no bigger than 6×6 inches. Smaller would probably be better. The more grout, the less likely you are to slip. The size is up to you when it comes to the walls, but remember to keep it small for the floor. Both small tiles and large tiles have their benefits and drawbacks. 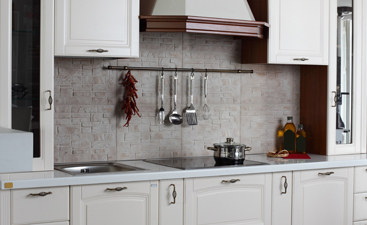 Small tiles often have more grout, so there may be more traction. They can also handle any curves of a shower much more smoothly than large tiles can, which you will need when tiling the sloping floor to the drain. Large tiles may be quicker to install, and they work well on shower walls. Do You Have a Shower Bench? If you have a shower bench that needs to be tiled, think about what would feel best to sit on. Most people would claim that sitting on larger tile is more comfortable than the rough grout on the edges of smaller tile. However, if the bench is curved, you may prefer the look of smaller tiles, which are easier to install. Keep your comfort in mind, particularly if you tend to use your shower bench. What Should You Put on the Wall? Most tiles will work perfectly on the wall of a shower, but consider all of the small details. Do you dislike cleaning your shower? Large tiles make cleaning much easier to do. 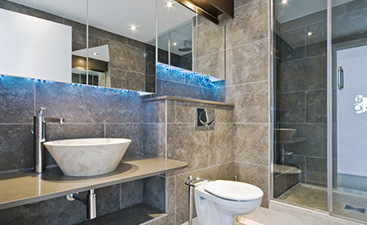 However, if you are going for glass tiles, small and colored might look best. With large, clear tiles, it can be easy to spot any trapped moisture in the shower walls. Whatever you choose depends on your style preference and how much time you are willing to dedicate to cleaning your shower walls. Do You Want an Accent Wall? 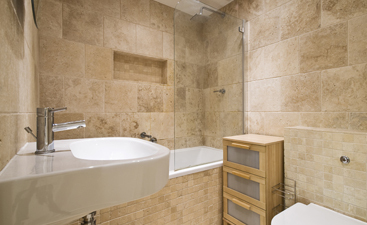 One option for your bathroom design is to choose two different types of tile to draw attention to an accent wall. This works particularly well if the two tiles have different textures and very different coloration as well. When the lighter tile is used for the accent wall, it can really brighten that section of your bathroom. When you decide that it’s time to update the tile in your shower, be sure to contact Transworld Tile for a free consultation. We can help you find the best tile solution for your bathroom! Don’t hesitate to check out our showroom located at 8250 Louise Ave., Los Angeles, CA 91325. We look forward to speaking with you about your design needs.